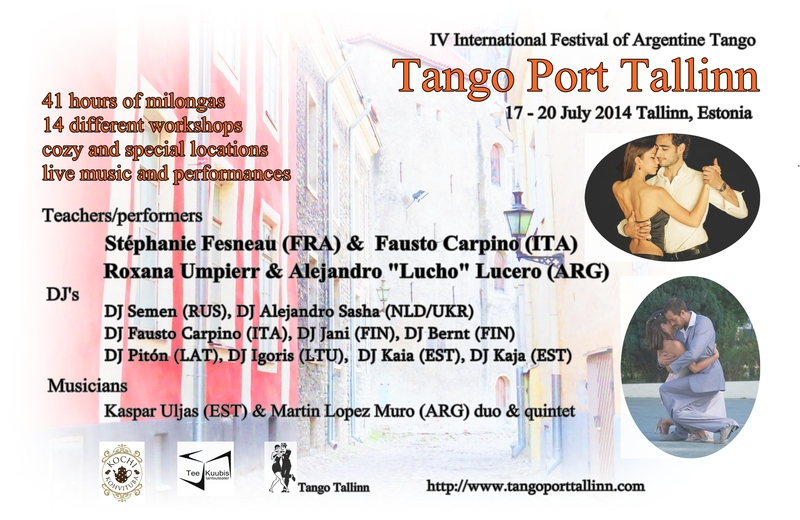 For the 4th time in a row, we invite tangueros & tangueras from all over the world to join Tango Port Tallinn vibes in the beautiful capital of Estonia – Tallinn. In the city that hides thousands of secrets in its romantic medieval heart, you will have the opportunity to attend workshops on three consequtive days given by the beautiful stars of the tango sky – Stéphanie Fesneau & Fausto Carpino (France, Italy) as well as Roxana Umpierr & Alejandro “Lucho” Luchero (Argentina). To make the festival atmosphere even more alive, LIVE MUSIC will be played during the Saturday concert-milonga. The performing artistic duo – Kaspar Uljas & Martin Lopez Muro – as well as the Quintet + Nele Suisalu (Estonia) joins together the musicality and inspiration from Nordic Estonia and colourful and warm-hearted Argentina. To conclude… and for the mathematics freaks, all in all, Tango Port Tallinn will offer workshops for a total of 16.5 hours (6 Fri – 6 Sat – 4.5 Sun), and outside-class dancing possiblities for a total of 41 hours (6 Thu – 9 Fri – 13 Sat – 13 Sun). Lithuania will celebrate its 96th birthday this year. To honour this event we invite you to special celebration milonga in Riga Latvian Society House (13 Merkela Street) which will take place on February 15th. We will be addressed by ambassador extraordinary and plenipotentiary of Lithuania H.E. Mr.Ričardas Degutis. We are waiting tango dancers for an autumn tango marathon in Riga to embrace our friends, dance on gold leaves and get to know new people. Together we will make a tango fest during the last weekend of October. Tango fest for friends, friends of friends, and we will be happy if friends of your friends will tell our news forward to their tango communities, because to make fest together much more enliven. Our moto is: EMBARCE FOR ALL. That means – no matter what kind of embrace or style of tango you prefer, when you respect your colleagues on dance floor and tango music – you are welcome! Tango fest of music and for DJs, because one DJ – this is good, but two DJs always better twice! Of course, not everybody will accept that kind of experiment – more difficult, impossible to use prepared play lists and you have to be VERY concentrated on the mood of milonga, BUT twice more drive and all time absolutely unexpected decisions are guaranteed, In other words, tandem of DJs it is jazz by DJs, duet to get a harmony for excellent atmosphere! During night for your attention will play music men DJs tandems, don’t miss them! And, on day milongas for you will “sing” duets of DJ-girls! And for dancers – we like if you are sitting not only for pleasure, but also for education. Our marathon will start on Friday with lessons of tango music history by Massimo Politelli (Italy). Massimo many times presented his lessons and very happy this time to listen him in Riga. We are waiting tango dancers for an autumn tango marathon in Riga to embrace our friends, dance on gold leaves and get know new people. Together we will make a tango fest during the last weekend of October. See you in Riga on October, 25-27! 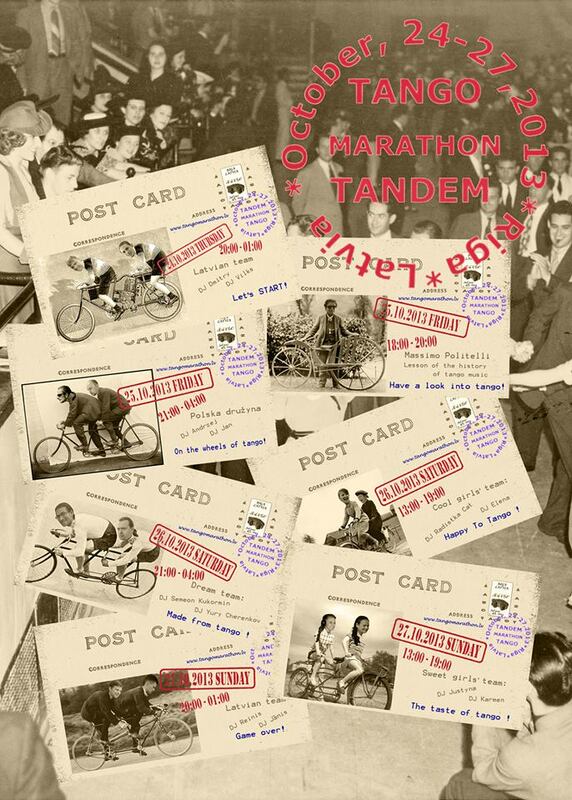 The event with Fabian Peralta, that was planned in Riga around 18 November 2013, is cancelled. Priecīga ziņa visiem tango mākslas mīļotājiem! Tango Sun Festival rīkotāji aicina jūs uz Argentīnas tango koncerta El Arte del Tango pirmizrādi 2013. gada 15. augustā Rīgā, Latviešu biedrības namā. Biļetes uz koncertu var iegādāties sākot no 2013. gada 25. marta Biļešu servisa kasēs. Biļešu skaits ierobežots. Par koncertu vairāk lasiet šeit. Good news for tango art lovers! The organizers of Tango Sun Festival invite you to Argentinian tango concert El Arte del Tango premiere in Riga, Latvian Society House, August 15, 2013. The tickets are available in Bilesu serviss starting from March 25, 2013. The number of tickets is limited. More about concert please read here. Sabrina & Ruben will give 8 workshops for different dancing levels. 2 workshops will take place on Friday 26 April at HiCentrs in Riga and 6 workshops on Saturday and Sunday at Doles Tautas Nams in Kekava. Workshop programme, prices and registration procedure can be found here. On Friday 26 April we will join with Ruben & Sabrina the traditional Fridays’ milonga at HiCentrs, on Saturday 27 April a Special milonga will be organized in Kekava (21:00 – 3:00) with DJ Evaldas from Lithuania. Sabrina & Rubens pasniegs 8 nodarbības dažādiem dejotāju līmeņiem. 2 nodarbības notiks piektdien 26. Aprīlī HiCentrā un 6 nodarbības notiks sestdien un svētdien Ķekavā – Doles Tautas Namā. Nodarbību programmu, cenas un informāciju par reģistrēšanos var atrast te. Piektdien 26. Aprīlī kopā ar Rubenu & Sabrinu piedalīsimies tradicionālajā piektdienas milongā HiCentrā, sestdien 27. Aprīlī mēs organizēsim īpašu milongu Ķekavā (21:00 – 3:00) ar DJ Evaldas no Lietuvas. We would like to announce that one more dance club is starting to organize milongas for its students and all tango community. The first event “Milonga – Il Gusto Del Balo” will take place on 20 April from 21:00 – … in Braslas str 29 Riga, Latvia. With DJ Diana Germane and a little show. For reservation please call +371 28614358. Mēs labprāt paziņojam, ka vēl viens deju klubs sāk organizēt milongas gan saviem skolniekiem, gan arī visai tango sabiedrībai. Pirmais pasākums “Milonga – Il Gusto Del Balo” notiks 20 aprīlī no 22:00 – … Braslas ielā 29 Rīgā. Kopā ar DJ Diana Germane un deju priekšnesumu.